Catching an escaped chicken or rooster is rarely any fun for you or the bird. 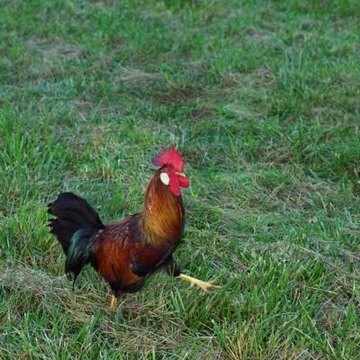 Roosters who are not in a chicken coop are vulnerable to attacks from various predators. They also can't do their job fertilizing eggs if they are not in the same coop as your chickens. It is important to catch your rooster and return him to his coop as soon as possible to prevent the accidental injury or loss of your bird. Chickens who are trained to return to their coop every night are more likely to do so when they escape. Make sure your rooster knows that the only place food, water and hens are readily available to him is inside his coop. Eliminate any bird feeders or available food sources from the area where your rooster has escaped to and only provide feed inside the chicken coop. Man the coop door and open it to allow the rooster back in during feeding time. Avoid feeding your rooster outside of the coop; you don't want him to think food is available anywhere but inside of the coop if you want to get him back inside. Roosters also tend to be very fond of their lady friends, so make sure you keep all your hens inside your coop where the escaped rooster can't get to them. Wait until your rooster wants to go back into the coop to get to the hens, then open the door and let him back in. Chickens go to roost at night. If you truly want to catch your rooster, it will be easiest when he is asleep. Locate your sleeping rooster and gently grab the bird so that you are holding both of his wings down, preventing him from flapping or flying away. If you don't feel safe catching your rooster with your hands, place a net or blanket over him to trap him and then hold him securely as you transport him to the coop. You can also try the net or blanket approach while the rooster is awake, but an alert rooster tends to see the net coming and will be harder to capture in most cases. You may want to wear gloves, long-sleeve clothing and protective eyewear when you attempt to pick up your newly captured rooster -- his beak and spurs can hurt you if he struggles. A poultry pole, also known as a poultry hook, can also be used to catch a rooster. The hook slips over one of his legs and can be used to pull the rooster to you. You may also choose to use a long-handled net to aid in your capture of the rooster. Nets are commonly used to catch birds in aviaries but can also be useful in snagging loose poultry. However, a net will not be too useful to you if your rooster still has his leg spurs. The spurs are sharp enough to cut through the net. Roosters who are reasonably comfortable with humans and have been taught to accept human handling are easier to catch than those who are essentially feral. Spend some time handling and interacting with your rooster on a regular basis so that if he escapes, he views you as a food source rather than a frightening predator. A reasonably tame rooster might let you pick him up and return him to the coop with minimal fuss, or he could be gently herded back into the coop by a person making shooing noises and hand motions. What Is the Recommended Height for Chicken Feeders?